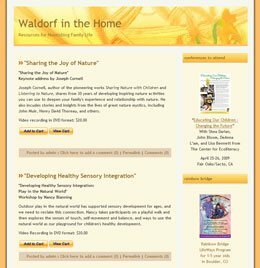 Waldorf In The Home :: International Portfolio :: PRO IT Service S.R.L. - Choose a professional and accessible service for your online image! Dave Taylor, the industry guru from askdavetaylor.com knows me and recommended my services to Rahima Dancy, the soul behind the 'Waldorf In The Home' Web site (www.waldorfinthehome.org). Rahima needed some movable type consultancy. During the second part of February 2009 Dave Taylor told me that he has somebody seeking for movable type consultancy and he would like to recommend me for this job, if I tell him I have the time to do it. As it is not on my habit to reject work, I definitely said that I am up for it. Shortly after Dave told me that he wrote to his contant recommending me and in matter of hours I've been contacted by Rahima with the exact job specifications. She wanted to have me move her Web site from her current hosting service to an account she was having with Comcast. Rahima's husband, Agaf, wrote to me that he already uploaded the web site files to Comcast and he even tried to move over movable type, but he ended up with a bunch of errors when trying to use the search or the post a comment functions. In such circumstances, as you can imagine, it was quite difficult to get this job done because I had no way to be able to retrieve the database behind movable type as well as to see what other plugins to hacks his movable type installation uses. What was still good was that he still had access to the movable type admin on his current server and that allowed me to backup the whole Web site data, not in SQL format (which I would have preferred), but in movable type 'backup and restore' format. After I've got a hold of this I've uploaded movable type to Rahima and Agaf's Comcast server. Guess what? After uploading the movable type files and updating the database information with the mysql database details that Agaf sent me I've got an error message that these details were not good. I've tried to retrieve the good one from Comcast or to create a new mysql database, but I was not able to do so because the Comcast admin is really weak at this point. Agaf replied back to me with the right password and I've updated the movable type configuration file. When I've tried to install movable type I've got another error 'Invalid login'. Because on Comcast admin I had no phpmyadmin option, I had no way to look at the database tables and see if there are any movable type tables inside (as this kind of error indicated there are some movable type tables, otherwise movable type should have just asked me to install it and for a new username and password). At this point I wrote back to Agaf kindly proposing him to host with us! I've explained him that we are partnering with Pair Networks, Inc. by basically offering the Pair Networks service plus our value added services. I've also pointed him to https://www.pro-it-service.com/en/movabletype_hosting.html for more details about our professional movable type hosting facility. Since our price is very competitive (much less that Comcast's) and since he was going to get a bunch of value added services hosting through us, Agaf kindly approved to have me relocate his Web site to one of PRO IT Service hosting server at Pair Networks. I've set Agaf's account, then uploaded his Web site static files, then uploaded and installed movable type. Once movable type has been installed I've tried to restore his movable type data. Guess what? Because he had some special characters the restore process stopped. I've corrected the problem. Then tried again to restore and the process stopped indicating another similar issue at another line. And so on, I've had to correct a couple of problems and on the forth or fifth attempt I've got his movable type data safely restored in movable type format. Then I've run a couple of files and folders permission commands via the server command line to make sure that Agaf's files and folders will be writeable by movable type. I've missed to mention you above that I've also upgraded Agaf's movable type installation to v4.24 which was the latest version at that time (it is still today, as I wrote this note on my portfolio). Because Agaf's templates were written in movable type v3.x format and since movable type v4.x the way comments are handled changed a bit, I had to update a bit his indexes templates to avoid an error. On another hand, Rahima and Agaf also had a couple of 'orphan' pages that they were linking from their Web site. Basically, these pages were created some time in the past within movable type. For some reason they deleted the movable type entries, and as movable type prior to v4.x wasn't able to also erase a file from the server when deleting the corresponding movable type entry, they remained with those pages as orphan pages. I've setup created a new template for this project which to manage pages, configured it and uploaded the content of the orphan pages I've identified within the movable type admin as what movable type starting with v4.x calls 'pages'. Last but not least, I've gad Agaf asking me to setup another 3 domains which to all point to http://www.waldorfinthehome.org/. I've configured these domains as 'parked' domains to the main one. This was pretty much it! Rahima and Agaf have been very satisfied with the work I did for them and told me they are going to write back to Dave and tell him that I did an excellent job for them. When I've asked for a testimonial they've said they would love to do it! I now realize that I should have thought about opening a testimonial section a lot of time ago... Just kidding! Let me show you two screenshots taken from this project Web site. 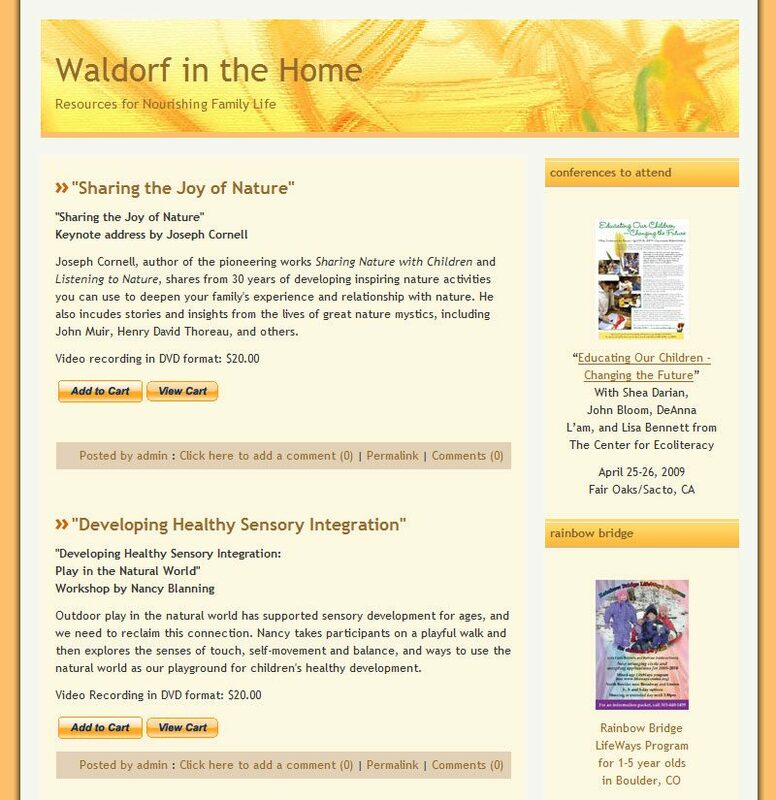 If you are interested to see it live online, consider going to www.waldorfinthehome.org. Contracting from Informed Family Life, Boulder, Colorado, U.S.A.